The Discours du Songe de Poliphile, which was published by Kerver in 1546, presented as a translation, merely “revue” by Jean Martin, was to have a curious fate, and a mainly unpredictable one even for its promoters. One of the first successes of this translation was no doubt to have made the main character so familiar that his name became the popular title of the text : instead of the unpronounceable original title Hypnerotomachia Poliphili, or “Struggle of love in the sleep of Polia’s lover”, in Jean Martin’s own dedication to Henri de Lenoncourt, the book became “icelui Poliphile”, and that it would stay. This too easy familiarity was only the most striking among the many delusions which made up the history of this text. Published in Venice in 1499 by Aldus Manutius, l’Hypnerotomachia Poliphili is basically a novel whose framework, not very original, is the initiatory dream. On the principle of the Roman de la Rose, for example, it harks back to certain topoi such as the enclosed garden, and the text recounts the journey of its hero Poliphile, “who loves Polia”, across the island of Venus, as far as the discovery of the goddess herself and the metaphorical realization of his desire for Polia. A second narrative, called book II, coming after the first but still fitted in the framework of the dream (from which the hero only awakens at the end of the novel), is a sort of autobiography of Polia before she enters as a “nymph” in attendance to Venus. Having said that, despite those familiar appearances, everything is strange : the book, with its splendid and anonymous woodcuts, the author, whose name, Francesco Colonna, is revealed in Latin only (Franciscus Columna) through an acrostic of the chapter headings, and the language, a sort of ultrascholarly and convoluted Italian, mixed with Latin and Greek to the point that it seems to be as much ungrammatical Latin as a too worked-over vernacular. The narration itself teems with digressions, descriptions of many monuments, huge for the most part and of improbable shapes, all’antica or at least appearing to be : an enclosure and entrance to the garden of Venus in which are superposed a triumphal gateway and a high pyramid, various fountains, the temple and fountain of Venus, richly decorated with the finest precious stones and marble, in calculated symbolic colors. Keen on epigraphy, the hero-narrator delights in noting all the inscriptions he finds, whether they decorate the triumphant processions of Love or of Polia, or the ruins of a collapsed temple in which the stroll is also a descent into the stay of the “morts d’amour”. Out of this teeming text, where an astonishing imagination creates a falsely antique but terribly likely world, (a fairly erudite deception, but perhaps less profound or detailed than it appears), the French translation would extract a book, close but independent, nourishing a tradition of study which pushed the Hypnerotomachia in the directions, other ones, leading to the Poliphile. The text made a certain stir, particularly in the literary circles in Lyon, when Jacques Gohory proposed the Hypnerotomachia to Jean Martin, who had already translated the work of several poets such as Bembo, Ariosto and Sannazar. The novel then seemed to take its place in a series of works meant to open up the French mind to Italian literature. But for Jean Martin, this work on the Poliphile was also a turning point ; almost at the same time or immediately afterwards, he translated Serlio, Vitruvius and Alberti, becoming the first great vector in the French language of antique treatises on architecture or that inspired by the antique. The Poliphile truly seems to be at the crossroads of all those texts ; beyond the storytelling canvas, Jean Martin perceived and underlined the importance of the architectural “fantasies” on the antique period, suited to nourish and reflect the fantasy world of his time. If it seems that Serlio himself wished to collaborate with Martin in translating his works, it is not improbable to think that the Poliphile-Serlio association around 1545 then pushed the translator to take on the two source texts for the descriptions in the novel, Vitruvius and Alberti. The 1546 edition is also a very fine book ; embellished with engraved figures which hark back to and adapt some woodcuts of the Aldine edition, and enriched by others, the work also remains one of the most beautiful printed achievements of the period. Jean Martin’s text is the version that would most feed the fantasies and the discussions centered on the novel. One of the first points of that controversial tradition concerned the personality of the author. Like Gohory, Martin puts Francesco Colonna in the Colonna family, since he presents him in his dedication as “un gentilhomme docte et de maison illustre”, knowledge apparently only able to go hand in hand with nobility. It would take several centuries and torrents of ink for this delusion to be dispelled (not entirely, for the fires of this attribution quarrel are not entirely extinguished) and his authentic personality restored to him. He was a monk in the Convent of the Santi Giovanni e Paolo in Venice, with a life almost as agitated as the inordinate dreams of his character, no doubt using the good library of his convent, but perhaps also spending time with the learned people and humanists of the Verona and Treviso area. Generally, Jean Martin did not claim to produce an exact translation, a notion which was not current in his time for this sort of work. It is truly an adaptation : translating the overflowing sentences of the Hypnerotomachia meant opening the reading of the Poliphile to “French brevity”, at times reducing or condensing the text, or else following it step by step, according to whether the translator believed the passages were transposable to the French mind. Therefore it is a slightly different book than the original which was offered to a public of cultured (but not necessarily erudite) nobles who were interested in antiquity, architecture, palaces and gardens. For the main trompe l’œil established by Jean Martin’s work was to have made Poliphile a guide in just these fields, and not in the amorous or philosophical initiation in pursuit of the happy medium between contemplation and action. The idea is visible right from the preface : the first summary that Jean Martin gives of the text is the enumeration of the descriptions of architecture, the offer the most liable to attract the literary customer. The idea would endure ; Conrad Gesner, in his Pandectes of 1548, the “Matières” part of his bibliographic catalogue, would classify the Hypnerotomachia (he did not mention the French translation, even if he seemed to have been aware of it) almost among the treatises on architecture, and would indicate all the architectural descriptions by rubric : columns, door. Next, it became a habit ; if Rabelais seemed to remember that the Poliphile was a fictional narration, most of the 16th century readers nonetheless sought architectural models in it (Jean Martin himself used some engravings from the edition to constitute the scenery for Henri II’s entry into Paris) or garden art. The following translation of Béroalde de Verville in 1600 would have the text slip towards alchemy, and that of Popelin in the 19th century would bring it back to the bosom of the dream, but the “architectural” reading remains the one that most marked the history of the text. In the 18th century, the book was still found as a reference in the libraries of architects such as Soufflot, thus confirming the success of the brilliant illusion created by Colonna as much as by his intervention. People have often had a lot to say about the influence of Martin’s Poliphile on the development of Renaissance architecture in France. Louis Hautecoeur, for example, devotes a long exposition on Jean Martin’s work in the introduction to the second volume of the first book of his Histoire de l’architecture classique en France devoted to the “Renaissance des humanistes” (1965, pp. 111-115), but he is hard put to give precise and convincing examples of where plates of the work were used concretely. As Martine Furno says, it is more useful to turn towards the short-lived constructions of the ceremonial entries ; it is obvious that the elephant carrying an obelisk (f. 10) inspired Martin for Henri II’s entrance into Paris in 1549, except that it is a rhinoceros carrying the obelisk. The various floats were also copied many times in the processions of these ceremonial celebrations. Likewise, landscape gardeners made the best of numerous models of garden temples illustrated in the Poliphile. On the other hand it is possible that Martin’s translation had some influence in Spain. Delfín Rodríguez Ruiz pointed out several possible influences of the Aldine plates on the architecture of Andres de Vandelvira at Ubedà and Jaén ; but he emphasizes that one of the characteristics of his manner, the use of cabled fluting of unequal heights in the columns, has no equivalent in Europe other than the plate of folio 101 of the French edition representing the tomb of “Trébia fille de Lucius Sextus Trebius”. F. Colonna, Le songe de Poliphile, translation by Jean Martin (1546), presented, transliterated and annotated by G. Polizzi, Paris, Éditions de l’Imprimerie nationale, 1994. R. Brun, Le livre français illustré de la Renaissance, Paris, Picard, 1969, p. 157. M. Furno, Une “fantaisie” sur l’Antique : le goût pour l’épigraphie funéraire dans l’Hypnerotomachia Poliphili de Francesco Colonna, Genève, Droz, 2003. G. Goebel, “Poliphile ancêtre du fantastique ?”, Lendemains, 2003, 28, 110-111, pp. 21-26. 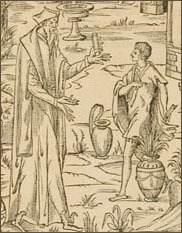 L. Lefaivre, Leon Battista Alberti’s Hypnerotomachia Poliphili. Re-Cognizing the Architectural Body in the Early Italian Renaissance, Cambridge (Mass. )/London, MIT Press, 1997. M. Lorgnet, Jean Martin translateur d’emprise, Bologna, Editrice CLUB, 1994. G. Polizzi, “Poliphile ou les combats de désir”, H. Brunon (ed. ), Le jardin, notre double, Paris, Autrement. Série Mutations, 1999, 184, pp. 81-100. D. Rodríguez Ruiz, “Andrés de Vandelvira y después. Modelos perifericos en Andalicia, de Francisco Colonna a Du Cerceau”, A. Moreno Mendoza & J. M. Almansa Moreno (ed. ), Úbeda en el siglo XVI, Úbeda, El Olivo, 2002, pp. 321-367. H. Zerner, L’Art de la Renaissance en France. L’invention du classicisme, Paris, Flammarion, 1996, p. 282.